Well it's that time of year again! The time to dust off your Christmas tree and decorations, or in my case buy a new tree and decorations. We somehow lost ours in the last house move and I thought I'd better start again. Obviously leaving it too late to actually make all my decorations again, I've had to buy them. I did however think I could squeeze in one decoration, and happened to come across a sweet little angel from one of my favourite magazines which included a kit to make her. I hit upon the brilliant idea of up-cycling some plastic shopping carrier bags, the kind you get your groceries in. So I scrounged around and found 2 that were mostly clear with minimal writing on. I rolled them up and took some scissors and cut uneven strips off the bags. Once I'd chopped them up I proceeded to stuff my angel. This worked like a charm. 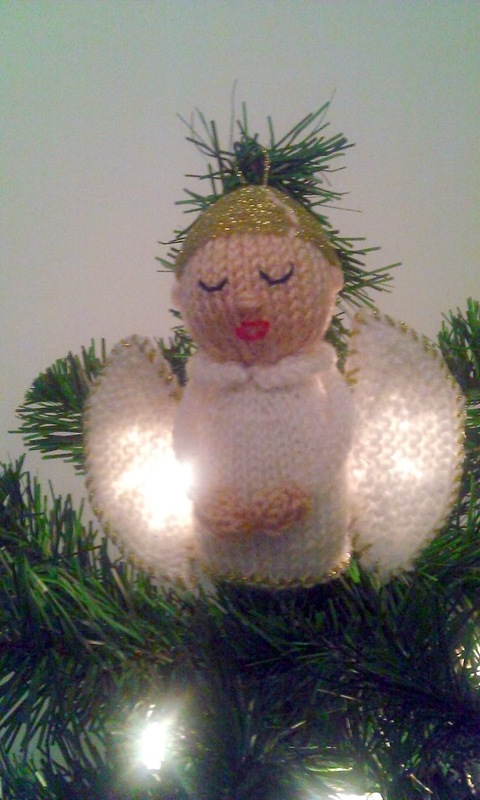 I took a photo during the assembly to show you all, and one of the completed angel hanging from the tree with 2 fairy lights strategically placed behind her wings.